The town of Danforth has honored its most senior resident by dedicating this year’s town report to Arey Golding. 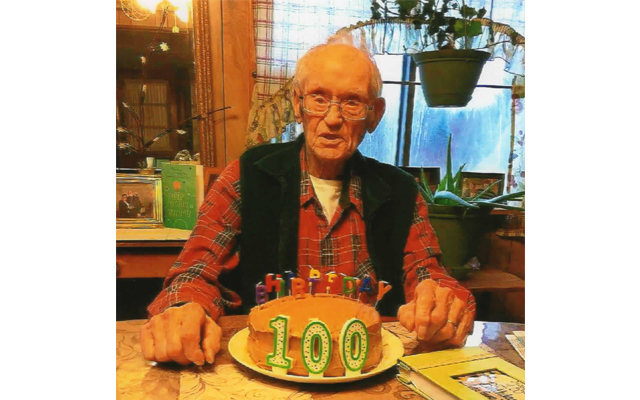 DANFORTH, Maine — The town of Danforth has honored its most senior resident by dedicating this year’s town report to Arey Golding. Golding, 100, was born Dec. 6, 1917 and grew up in Danforth, where he attended school and later worked as a logger with his father. On Oct. 30, 1939, he enlisted in the United States Army, where he fought in World War II. He achieved the rank of sergeant with the Company A 604th Army Engineer Camouflage Battalion. He received many decorations and citations during his time in the service, including the Good Conduct Medal, American Defense Service Medal and the European African Middle Eastern Theatre Campaign ribbon. While he was in the service and on leave, Golding’s best friend introduced him to the woman who would later become his wife, Beatrice Brennan. The two married on Sept. 23, 1941, and had four children, Arey Jr., John, Elizabeth and Sally. After being honorably discharged from the Army on Aug. 13, 1945, Golding purchased his future homestead on the Irish Settlement Road in Danforth. In 1965, the family moved to Wingdale, New York, where Golding worked at the New York State Harlem Valley Psychiatric Hospital until his retirement in 1980. The family moved back to Maine upon his retirement and Golding promptly joined the Grange. He loved calling numbers for the Bingo events and helped with the renovation of the Grange Hall. His beloved wife died in 1989 and in 1990 he remarried to Elizabeth Gillis. At 100 years of age, Golding is Danforth’s eldest citizen. He has nine grandchildren, 22 great-grand children and 13 great-great grandchildren.